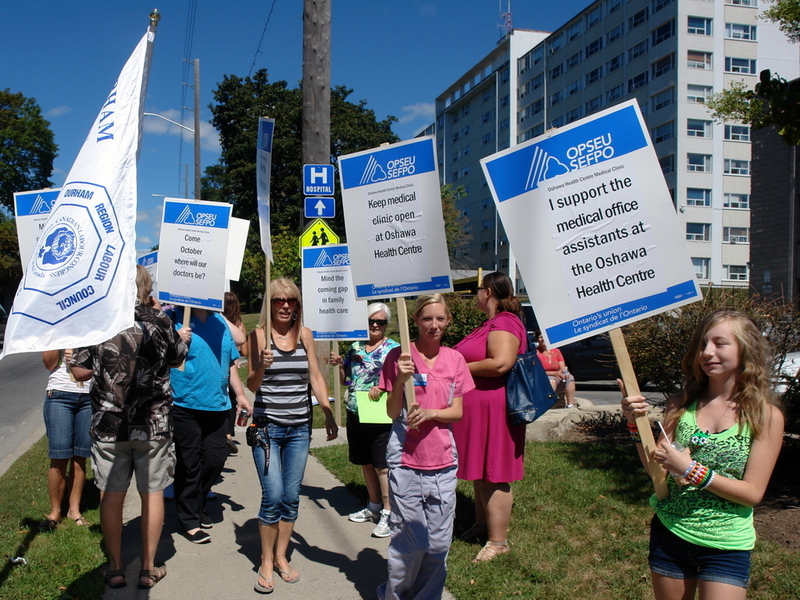 Medical office assistants and their supporters picket outside the Oshawa Health Centre August 29. The workers were told they were losing their jobs at the medical clinic upon the retirement of chiropractor Dr. Adrian Pettyan. Picketing OPSEU members got a partial result for their efforts outside the Oshawa Health Centre on August 27. Medical office assistants at the Oshawa Health Centre were calling for the medical clinic’s owner to reveal his plans for the future of services offered at the clinic after it formally closes at the end of September. Dr. Adrian Pettyan, who says he owns the clinic, had been adamant patients were not being “abandoned,” but could not say earlier in the week where the clinic’s health practitioners would move their practices. Pettyan told the news media yesterday that he expects most of the doctors will make lease arrangements to continue working out of the facility at the corner of Adelaide and Simcoe Streets. The statement was not a surprise for the union, who knew that Pettyan would want to fill the space of the closed clinic as owner of the building. It still raises questions as to what primary care services will remain within the vacated clinic, and whether the remaining doctors will do the right thing and invite back the workers and their union. With a long labour history, Oshawa residents may want to first see how the doctors respond to the dismissed workers before returning to the restructured clinical practices. The dismissal of the unionized assistants comes at a time when their doctors’ own bargaining representatives, the Ontario Medical Association, is trying to challenge the province’s cuts to their fee schedule. Despite the cuts to their fees, doctors remain a significant occupation within the top 1 per cent of Canadian earners, whereas the medical lab assistants at the Oshawa medical clinic were earning slighty more than minimum wage. The workers are hoping that a new ownership structure can still be worked out at the clinic to allow them to return to their jobs in October. On Tuesday the Oshawa Health Centre put out its own release to say “all practitioners (to our knowledge) are going to continue to treat and care for their patients at locations of their choosing.” There was no indication at that time whether that meant patients had to travel far or simply show up at the same location they always have. For the past week Dr. Pettyan has been coy about the future of the clinic. Last week he posted a notice to say it was closing, a few days later took it down and said he was retiring and it was up to patients to ask their health practitioner about continuity of care. Last week Pettyan had also written a personal letter to the OPSEU-represented medical office assistants to give them notice that the clinic was closing as of October 2012 and that their jobs were being terminated as a result of his impending retirement. At the time he made no offer of severance for those who completed their notice period. Two of the seven doctors in the clinic have said they will be moving to the already unionized Glazier Medical Centre in downtown Oshawa. At least two of the clinic doctors have sent letters to patients to say that they will now remain at the Simcoe and Adelaide address operating a solo practice. 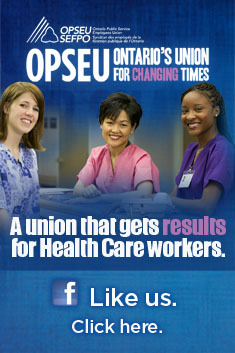 The 15 medical office assistants joined OPSEU in June prior to any discussion of the clinic’s closure. This entry was posted in Uncategorized and tagged Dr. Adrian Pettyan, Durham Region Labour Council, Jim Freeman, Medical Clinic, OMA, Ontario Medical Association, Oshawa Health Centre. Bookmark the permalink. This is ridiculous. I have known Dr Pettyan for almost 9 years. He is the quintessential healthcare professional. The man has been working as a chiropractor for over 23 years. He has dedicated his life to helping others reach and maintain optimal health. He has the right to retire if he so chooses. Patients are not being abandonded. Arrangements are being discussed with the patient before/during treatment. This is union propaganda. I think you missed the point entirely. No one questions Dr Pettyan’s chiropractic abilities. Dr Pettyan may be the “quintessential healthcare professional” but have you asked the staff that he works for what kind of a “boss” he is? Of course he has a right to retire, no one denies this, it is how it is being done. Almost like a child who doesn’t want to share his toy with anyone else so he’s willing to tear it down or break it first. Dr. Pettyan has the right to retire, certainly. Not many people retire and take out 15 jobs in the process, not to mention leave the question of patient access up in the air. The question is, are the docs that are “leasing” space in the same location going to do the right thing and offer these women their jobs back? This is such an unfortunate situation in that very dedicated workers who need to support their families are being manipulated.Perhaps politics is the reason but in the best interest of all,let’s get all back working!. Manipulated by who? Are you suggesting these workers don’t know what they are doing? I hope not. We should also add that they ARE working. It is Dr. Pettyan who has given them notice of termination. They didn’t quit. Will the docs that take over the clinic offer them their jobs back after Dr. Pettyan has left the scene? I will let you know what is ridiculous, I have seen first hand how hard those girls work and are continuously being mistreated and talked down too. He has every right to retire but in such a harsh way, this is not acceptable, these people are human beings as well with mortgages, bills, kids and so on. It’s a disgrace that he can turn around and abandon all of these people! I wish all of them all the best and please know that there is something better out there for “most” of the girls. The point I was making was very simple;medical receptionists are there to support their families and because they care about people.I am hoping that the ‘powers that be’ will see the benefit in keeping these dedicated workers at OHC. All staff have been given almost 2 months notice that they are losing their jobs. 2 months is fair notice. I just really don’t like that Dr.P is being made out to be the bad one here in terms of job loss. The man is retiring. The issue here is the docs who are taking over getting things together and deciding who will be kept on staff and who won’t. It is unfair to villanize this man when he is retiring and handing the practice over to the docs who are currently practicing there. Dr P is very particular…..I have also witnessed this over 9 years. He gives 110% and expects the same from those around him. Nothing wrong with that….especially when it comes to my health. I am sure that everyone who does their job there well should have nothing to worry about. The current practitioners will see their value….why would they want to retrain everyone. I don’t think 5 weeks comes close to 2 months notice. There is much more going on than it appears. I really like Dr.P…..but I think some of those girls should get some kinda severence. It broke my heart when one of the staff told me, she had just retuned from Mat Leave, and now she won’t even get EI….and the other secretary was pregnant! but the fact this was announced just after they got a union in, is suspisious! Sandra, the girls were absolutely not given 2 months notice. try 5 weeks. And “notice”? Try a tiny little sign posted for the patients to see. That’s how they learned. And as for the physicians who are staying getting to keep staff? Out of the question. A little bird told me that the remaining doctors are forbidden from keeping staff due to the fears of the union, and temps will be hired to replace the hard workers. But hey, all in the name of whats best for YOUR healthcare, right? Put your claws back in, Randall. You appear to be very angry. Not once did I infer that it was best for ‘my healthcare’ for people to lose their jobs. It is unfortunate whenever anyone loses their job, especially in today’s job market. I do not support job loss at OHC or elsewhere. My comment was about the healthcare provided to me by Dr. Pettyan.